As a student of Renaissance art, I’ve been obsessed for years with the following question: “Am I the only one that’s noticed there is nothing from the New Testament in the entire Sistine Chapel Ceiling?” Think about it. The most important work of Catholic art ever, in the Pope’s personal chapel, consists of panels depicting Genesis, Noah, Jonah … scenes entirely from the Old Testament. Surrounding these panels are prophets, sibyls from pagan mythology, and a frat-house-worth of nudes. 300 figures in all, and not one Saint, Virgin or Savior, the subject matter of 99% of the Renaissance art found in Catholic churches. So there I was, my first night in Rome, mentioning this to my friend James Barron, an ex-pat art-dealer who has lived there from years, and he replied “Actually there’s a new book about it, a collaboration between a Rabbi and a Vatican tour guide. It made the NY Times best-seller list.” That night I googled it and found, The Secrets of The Sistine Chapel: Michelangelo’s Forbidden Messages in the Heart of the Vatican, by Roy Derliner and Rabbi Benjamin Blech. The book argues that Michelangelo, unhappy with the Church and the Pope that commissioned him, drew heavily on Jewish culture and the doctrine of Kabbalah in designing the Sistine Chapel. Pope Julius II, who commissioned the ceiling, wanted Michelangelo to paint scenes depicting the 12 apostles. Michelangelo railroaded through his entirely different design by taking advantage of the fact that the “Warrior Pope” was off on one of his many empire-building campaigns. When Michelangelo was a teenager, he was taught by the greatest minds of Florence as a member of Lorenzo de Medici’s court. No news there. What’s news to me is that one of his main teachers was Pico della Mirandola, an expert on Judaic texts who had one of the largest Kabbalah collections in the world. The authors had a convincing enough argument that they were able to get Professor Enrico Bruschini, renowned expert on the Vatican Museums and the Official Art Historian of the American Embassy, to write the introduction to the book. One of the clues that put him over the edge was a figure wearing the cap of shame and circle on his sleeve that the Church imposed on Jews during that time. Michelangelo places him in the inner circle of the elect, as a blessed soul in Heaven, with an angel pointing it out. The piece of paper painted to the left of the prophet Jeremiah’s knee shows the Hebrew letters alef and ayin. As with many of Michelangelo’s hidden visual messages these are invisible to the naked eye 65 feet below, and can only be seen with binoculars. 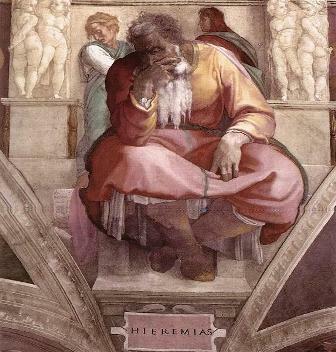 Michelangelo’s own face appears as that of Jeremiah — the tortured lamenter of the Old Testament. Unfortunately, it’s impossible to ignore the authors’ desire to create a sensation akin to that of the “Da Vinci Code” (which A.O. Scott called “Dan Brown’s primer on how not to write an English sentence”). That part is pretty unappetizing. But anyone with a dog-eared copy of The Agony or Ecstasy in their bookcase knows that there was no love lost between Michelangelo and Pope Julius. And, although Michelangelo was not a participant in the Bonfire of the Vanities (Thank God! ), he was a believer in many of Savonarola’s teachings, especially about the need of papal reform, and was unhappy with the Catholic Church under the Warrior Pope. It was not unlike him to place hidden messages in his art works. The Last Judgement is full of them. For further exploration, there is a very good interview in The American and then there is the good Rabbi’s personal post. Bring a pound of salt for that one. But either way, this enlightening exploration gives the Sistine Chapel a whole new meaning to us non-Christians who love Renaissance art. Thanks for the great, eye opening history lesson and this new spin on Rome. Looking forward to getting back there and looking at things from a different perspective. Robin, thank you so much for your continued commitment to sharing so much of the knowledge and insights you have gained, with all of us!! Very thought provoking and much appreciated. welcome home! Always fascinating to see history from an uncommon perspective. Makes one wish that time travel were possible to go back and ask questions as to their original intent. Wish I could have been there with you! When is your next trip Obi Wan Robin. That is sooooo interesting. Interesting that you thought I’d find it interesting, too. I happen to be taking a non-denom bible study class and we are studying genesis. Fascinating how the folks in class take so very few words and drag in their dogma…THANKS. I’m gonna have to become a regular reader. BIG hugs! Great Article Robin. It is so wonderful to stumble upon your interesting writes from time to time. No boring reading here! Thanks. This is so interesting, when I was at the sistine chapel this summer I was wondering the same thing!! Your website is awesome, your bike tours look like they must be so much fun!! It was a pleasure serving you ladies at kitchen 1540 this week, hope to see you again…I could use another little wine lesson, you seem to know alot and im just getting started in the world of fine dining!! 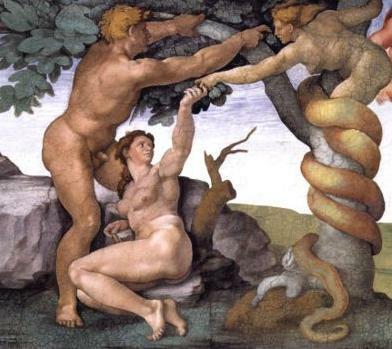 Did you also notice that the ‘female’ in the Tree of Knowledge painting does not just have non female like breasts but that her body is very muscular and masculine? Story I was told while visiting Rome, that Michelangelo was very enamored with the male body because he was a homo sexual.Does that explain this? I am not an expert, but I can tell you the exploits in the Old Testament are more visual and primal, and that Mike was at heart more of a humanist and than a believer. He just drew upon the more sensational source material. Steal from the best and then make it your own! Another interesting thing to see at the Vatican are the catacombs underneath the church. Many different religious symbols there!